Observing decision makers, their physical environment, and their interaction with their physical, ergonomic environment is an important unobtrusive method for the systems analyst. Through observing activities of decision makers, the analyst seeks to gain insight about what is actually done, not just what is documented or explained. In addition, through observation of the decision maker, the analyst attempts to see firsthand the relationships that exist between decision makers and other organizational members. Observation of decision makers’ interactions with technologies can also reveal important clues regarding HCI concerns, such as how well the system fits with the user. Managers’ workdays have been described as a series of interruptions punctuated by short bursts of work. In other words, pinning down what a manager “does” is a slippery proposition even under the best of circumstances. For the systems analyst to grasp adequately how managers characterize their work, interactive interviews and questionnaires are used. Observation, however, allows the analyst to see firsthand how managers gather, process, share, and use information and technology to get work done. A sample page from the analyst’s playscript describing decision making. Playscript is an organized and systematic approach that demands the analyst be able to understand and articulate the action taken by each observed decision maker. 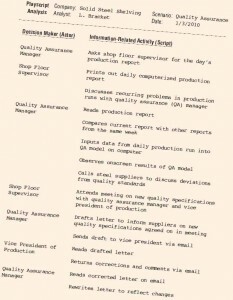 This approach eventually assists the systems analyst in determining what information is required for major or frequent decisions made by the observed people. 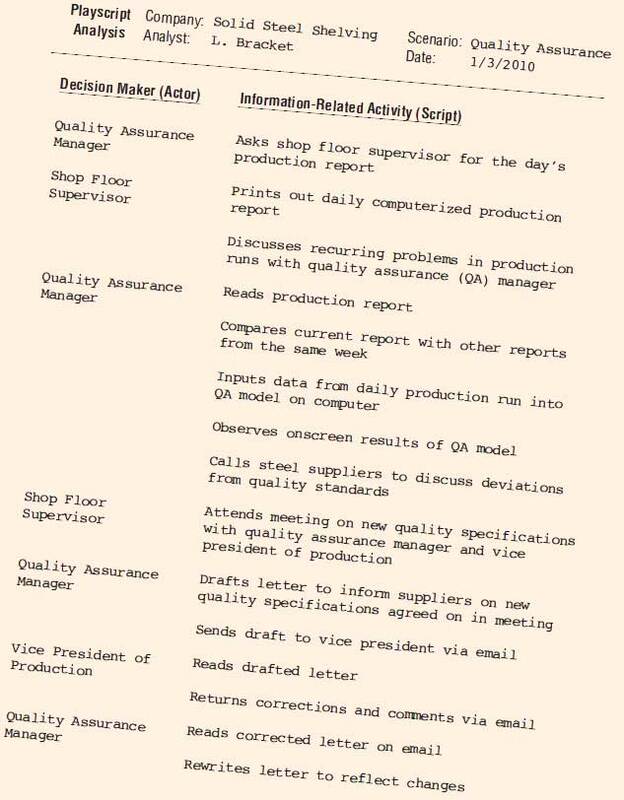 For instance, from the quality assurance manager example in the playscript, it becomes clear that even though this decision maker is on the middle management level, he or she still requires a fair amount of external information to perform the required activities of this specific job.